At the end of 2016, there were 5,083 commercial banks operating in the United States. This number has been declining for the last few decades as fierce competition forces mergers and acquisitions in the industry. In order to stay relevant and provide customer service in the way modern customers demand, banks must make use of the opportunities provided by social media. Where is the Growth on SocialMedia for Banks? Banks have a far larger average audience size on Facebook than on any other social network. With an average of 650,000 fans, it’s more than three times larger than the average audience on LinkedIn. For many industries, brands do not have a large presence on LinkedIn. However, with an average of 187,000 followers per bank, LinkedIn should be an essential component in any social media strategy. Surprisingly, only 10 banks from the 30 analyzed had a presence on Instagram. The average audience size was just 16,000 but it is growing at a rate of 27%. What are Banks Talking About on Social Media? To answer this question, we used the Unmetric Discover product, a searchable database of over 500,000,000 pieces of brand content published over the last five years. The four most popular topics are shown here. Career growth, new careers, switching jobs and job opportunities at various branches were the most talked about topics for banks in this report. KeyBank highlighted how they are one of the best employers of veterans, which was liked by over 2,100 people. Financial tips form a key pillar in the social media content for banks. Fifth Third Bank took it one step further by helping and encouraging parents to educate their kids about financial planning. It resonated well with the audience, as one of the most liked posts in this category. Unsurprisingly, a large portion of what banks talk about on social media is related to finance. However, the most popular topic was jobs and careers. Banks talked about potential career opportunities, switching careers and advertised the positions available at their various branches. Promotional offers aren’t just restricted to retail and consumer brands. 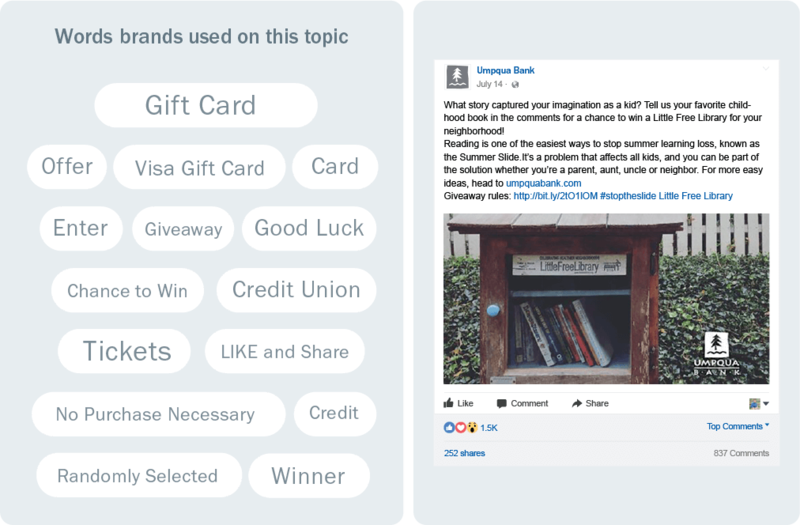 Umpqua Bank combined a giveaway with community giving in this post to create one of the most shared promotional posts in the industry. Talking about retirement is a common topic for banks, but this timely post from Regions Bank had a clear audience in mind. It was the most engaging post around the topic of retirement. 2015 was a watershed year for many banks as they experienced the first significant drop in social media content published. The start of 2016 saw another pronounced drop in content, and so did 2017. It seems like banks evaluate their social media strategy at the end of each year and decide to reduce the amount of content to be published in the upcoming year. The biggest casualty is Facebook. Banks have gone from publishing a maximum of 60 posts per quarter to 18. However, a shift from publicly viewable content to ‘dark posts’ which are hidden from the timeline cannot be ruled out. BBVA Compass has been the most prolific bank on social media in 2017, publishing an average of 14 pieces of content per day. Wells Fargo publishes 95% less content on Facebook than it did in 2013 but Santander US now publishes twice as much content compared to 2013. Although banks have been publishing less content overall, the number of interactions on that content has continued to increase. Early indications suggest that interactions in 2017 have fallen slightly compared to 2016. However, on Twitter and LinkedIn, banks are witnessing an increase in the amount of interactions on content published. Facebook remains the most dominant social network for interactions, accounting for 67% of all interactions that a bank receives. Capital One is winning the race for total interactions on its Facebook content garnering 317,904 interactions on its 79 posts in 2017. Bank of America leads the way for total interactions on its Instagram content in 2017, but Wells Fargo generates twice the amount of interactions per post. In the first half of 2017, video content accounted for 16% of all social media content published by banks. If the current trend continues, it is estimated that banks will have published over 150 videos each by the end of 2017. The reason for the explosion in videos can be tied back to content reach. Content that is shared by users on Facebook is amplified with each additional share. Video content is twice as likely to be shared by users than any other content. 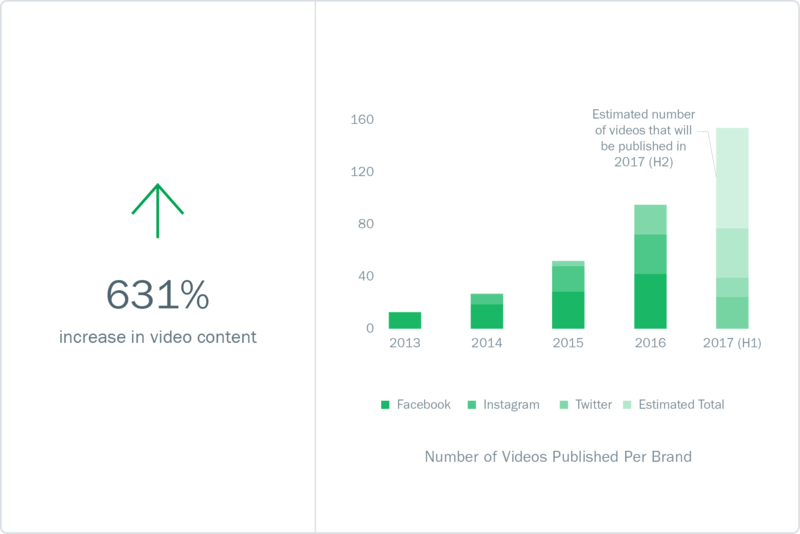 If we consider trend one i.e., the decline in the amount of content published by banks, it’s possible that these banks are finding more value in publishing more videos and far less of any other content type. 59% of TD Bank US’ posts on Facebook were videos in 2017. BMO Harris Bank was a close second with 56% of posts being videos. 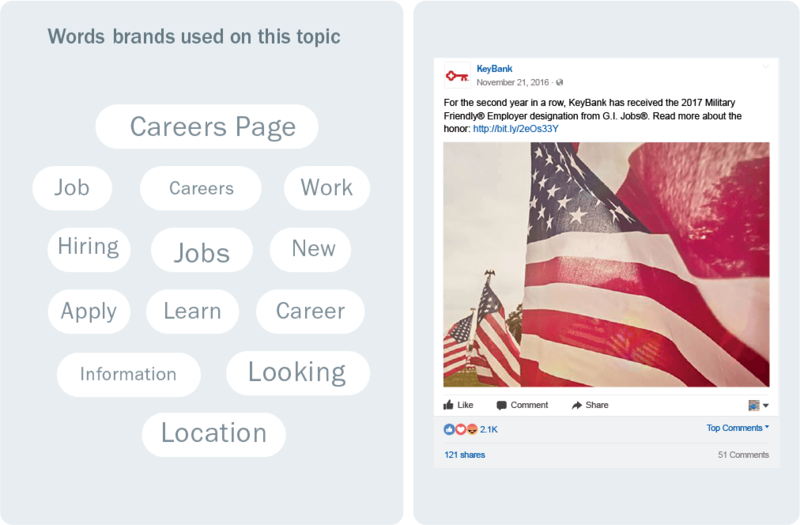 Capital One generated the most interactions on its videos published on Twitter, but its animated GIFs saw almost four times more interactions per tweet. Organic reach is virtually dead on Facebook. 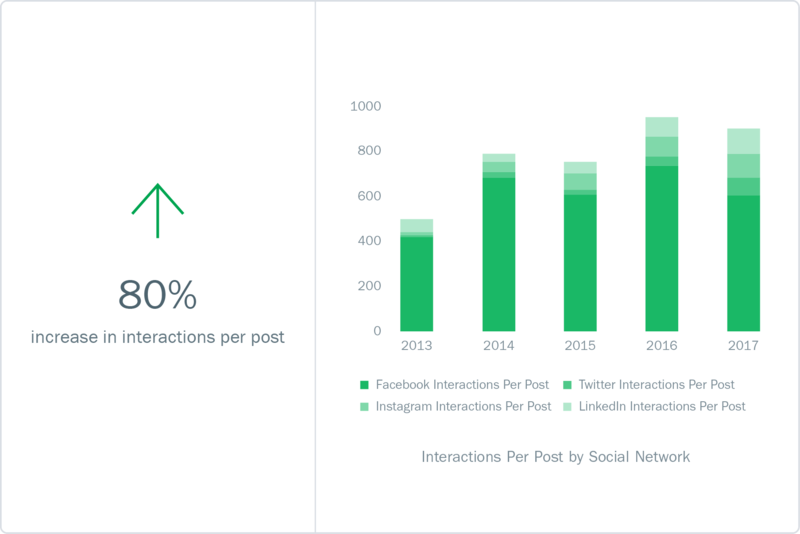 Non-promoted content is only likely to generate 90 interactions per post on average. Promoted – also known as boosted – content generates an average of 1,930 interactions per post – 21 times more than organic posts. 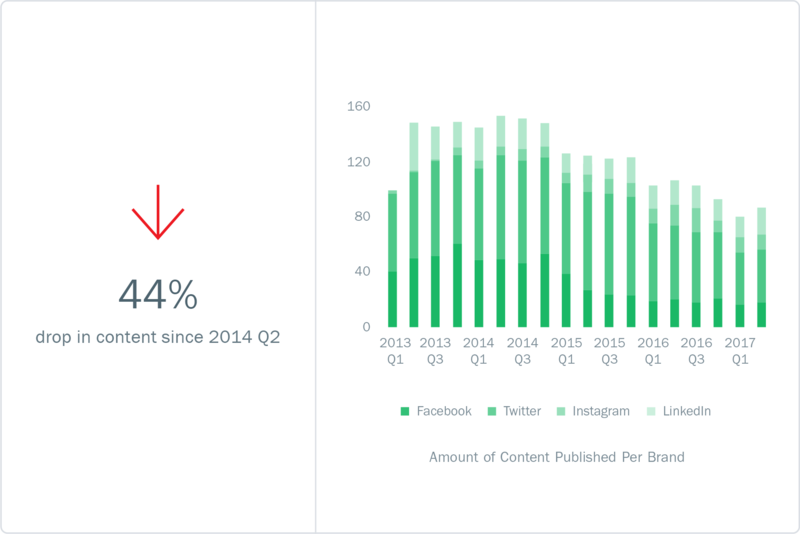 Since the volume of content published on Facebook has been dropping quarter on quarter, the amount of promoted posts has also been dropping. 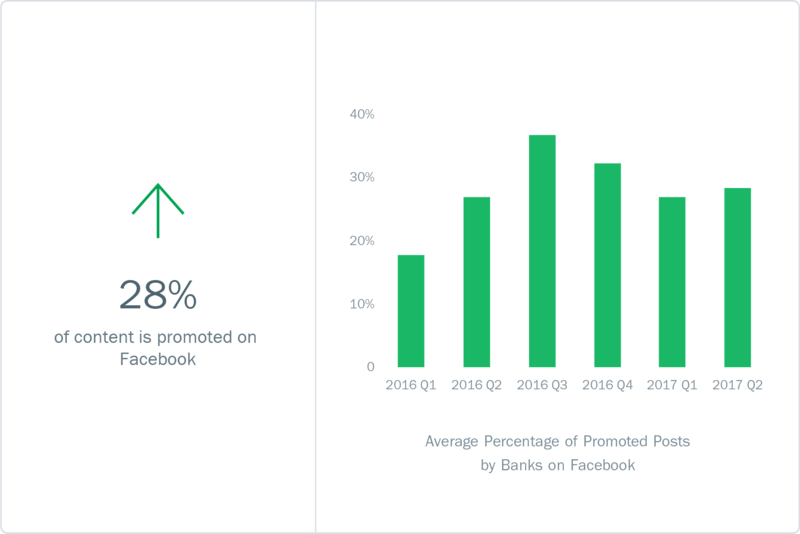 However, as a percentage of posts, promoted posts have ranged between 27% and 37% in the last five quarters. 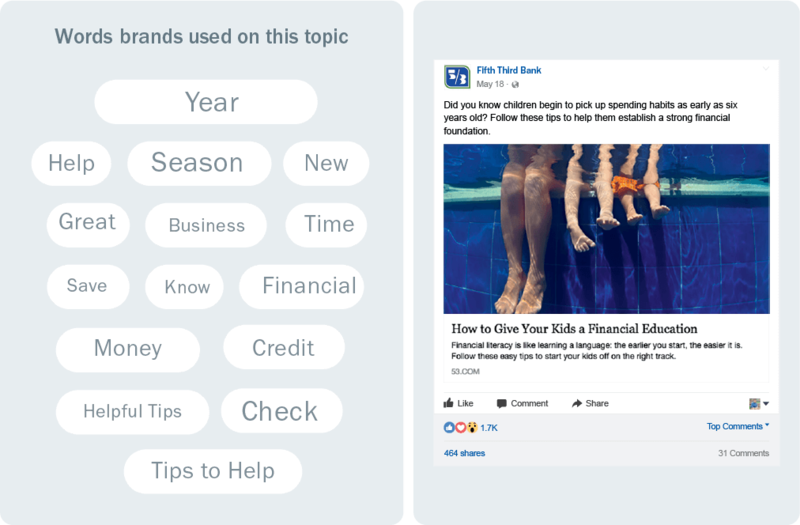 Fifth Third Bank promoted 75% of its content on Facebook in 2017, while Comerica Bank promoted less than 3% of its posts. 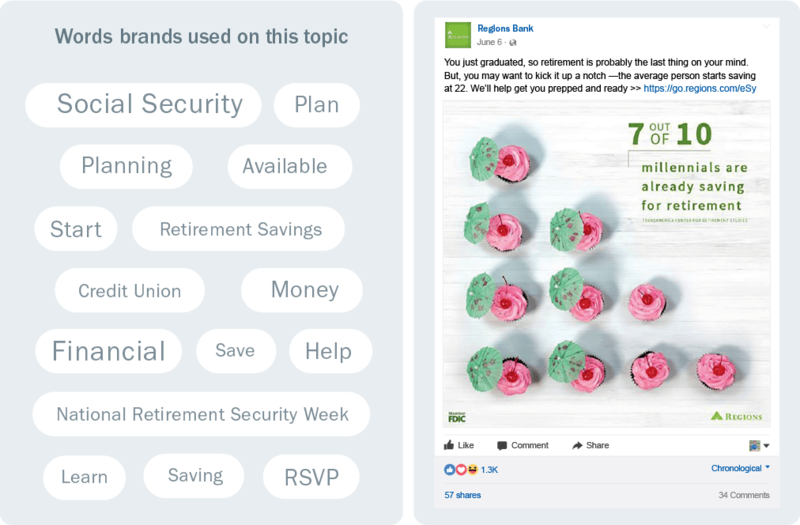 For BB&T, Capital One and Regions Bank, promoted content accounted for more than 95% of the interactions these banks received. Banks reply to significantly more tweets than they did in 2013. In 2016, 36% of user tweets were responded to within 15 minutes – the highest percentage in the time period of this report. However, we also found that the Average Response Time (ART) has increased steadily over the last four years. Further investigation revealed banks replying to a small number of user tweets that were several months or even years old. This impacted the overall average reply time. 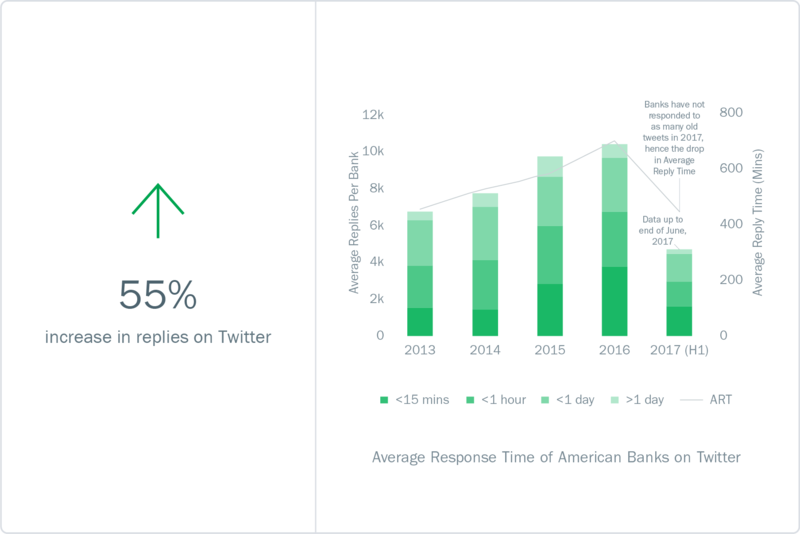 In 2017, banks replied to a third of user tweets within fifteen minutes and two-thirds of user tweets within 60 minutes. Just 5% of user tweets took longer than one day to reply to. Bank of America’s customer support handle replies to around 170 tweets per day. 38% of tweets are replied to within 15 minutes. TD Bank US had the fastest response time so far in 2017. It replied to over 3,100 tweets in an average of 43 minutes, and 75% of those tweets were replied to within 15 minutes. In 2016, banks saw an average of 37,000 user @-mentions on Twitter. 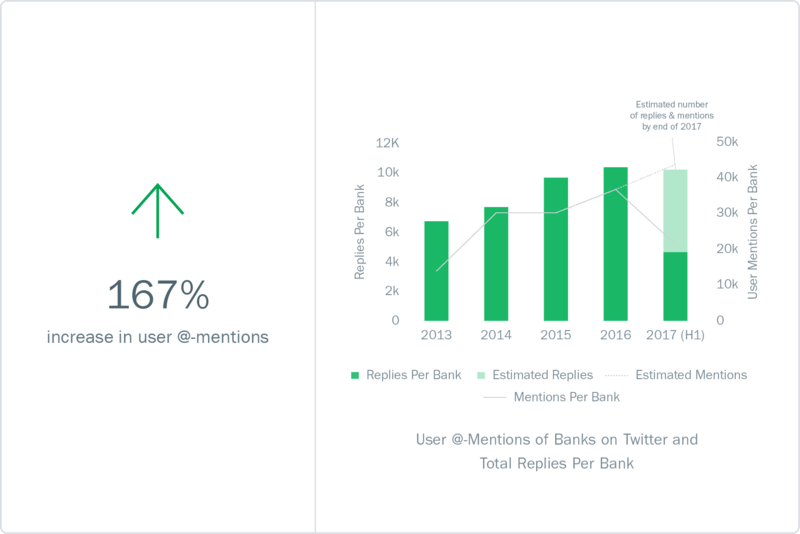 In the first half of 2017, banks had received an average of 21,500 user @-mentions. If the trend continues, it’s estimated that by the end of 2017, banks will see 44,000 @-mentions each – around 120 @-mentions per day. While the volume of interactions being generated by Twitter pales in comparison to Facebook and Instagram, it’s become an indispensable platform to provide customer service and banks should look to improve their capabilities in this area. Wells Fargo had 102,000 @-mentions so far in 2017 – 38% more than any other bank. More than 30% of those mentions came on February 1st. After tying up with Serena Williams and Stephen Curry, Chase generated more than 24,000 user mentions on Twitter in three days – 28% of the total @-mentions the bank received so far in 2017.